Heracles (Ancient Greek: Ἡρακλῆς, Hēraklēs, from Hēra, “Hera”, and kleos, “glory”), was a divine hero (semi-god) in Greek mythology, the son of Zeus and Alcmene. He was the greatest of the Greek heroes, of exemplary masculinity, the ancestor of royal clans who claimed and an exponent of the Olympian order against chthonic monsters. In Rome and the modern West, he is known as Hercules, with whom the later Roman Emperors, in particular Commodus and Maximian, often identified themselves. Extraordinary strength, ingenuity and courage were some of the characteristics commonly attributed to him. 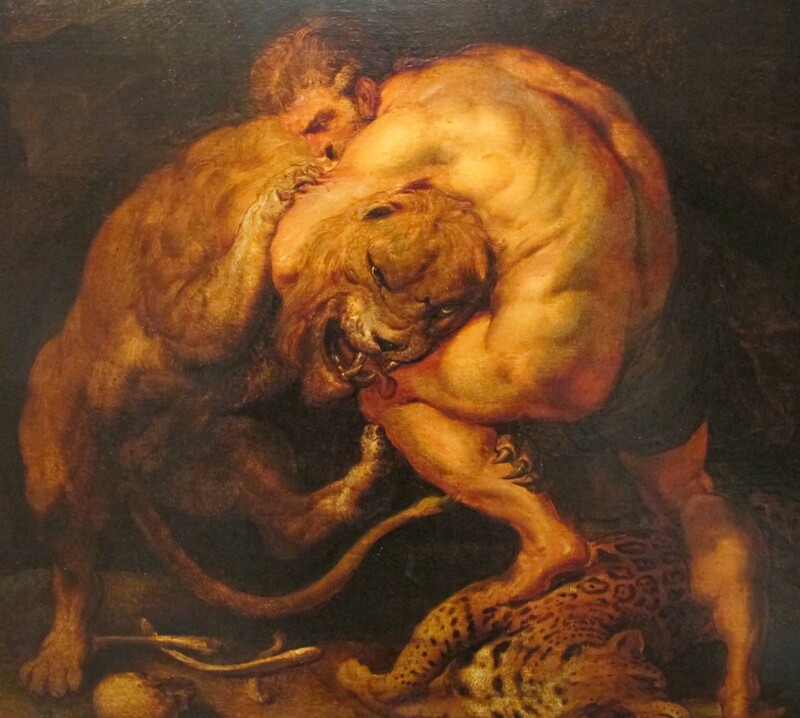 Heracles used his wits on several occasions when his strength did not suffice, such as when labouring for the king Augeas of Elis, tricking Atlas into taking the sky back onto his shoulders or wrestling the giant Antaeus. Along with with Hermes, he was the protecror and patron of palaestrae and gymnasia. His characteristic iconographic attributes are the lion skin and the club. These qualities did not prevent him from being regarded as a playful figure who used games to relax from his labours and played a great deal with children. By conquering and subduing dangerous elemental forces he is said to have “made the world safe for mankind” and to be its benefactor. Heracles was an extremely passionate and emotional individual, capable of doing both great deeds for his friends (such as wrestling with Thanatos on behalf of Prince Admetus, who had regaled Heracles with his hospitality, or restoring his friend Tyndareus to the throne of Sparta after he was overthrown) and being a terrible enemy who would wreak horrible vengeance on those who crossed him, as Augeas, Neleus and Laomedon all found out to their great cost. It all started in the Bronze Age citadel of Tiryns, which was mentioned in the epic poetry of Homer around the 9th century B.C., and later by the Roman poet and mythographer, Ovid, among others. Legend has it that the citadel was originally built by Proetus (Proitos), who was the grandfather of Perseus, and twin brother of Acrisios. The twins had the reputation of having been enemies since they were in their mother’s womb! When they grew up, they fought over the kingdom of Argos and Acrisios won the throne. Proetus went off to Asia Minor, where he married the king of Lycia’s daughter, and then returned with a Lycian army to take over Tiryns. The ancient Greeks believed they must have had help from the Cyclopes, the notorious one-eyed giants of Homer’s Odyssey, to build such massive walls around the citadel. A couple of generations down the line came the turn of Perseus’s grandchildren to squabble over the kingdom of Mycenae. In response, Zeus declared that the next descendant of Perseus would be king, expecting this to be own son, Herakles. But the goddess Hera stepped in so that her favourite, Eurystheus, would win instead. She caused the premature birth of Eurystheus while ensuring Heracles’ birth was delayed. The family feuds continued. The brave Heracles killed his own family, then blamed his fit of madness on Hera. This triggered King Eurystheus’ plot to get rid of Heracles, setting him the twelve Labours as a punishment. When Heracles returned alive wearing the skin of the Lion of Nemea after the first Labour, Eurystheus hid in a huge storage jar that may well have been within the Cyclopean tunnels of Tiryns. The twelve labours of Hercules are a series of episodes concerning a penance carried out by Heracles, the greatest of the Greek heroes, whose name was later Romanised as Hercules. They were accomplished over 12 years at the service of King Eurystheus. The episodes were later connected by a continuous narrative. The establishment of a fixed cycle of twelve labours was attributed by the Greeks to an epic poem, now lost, written by Peisander, dated about 600 BC.